Depending on when you discover a band for the first time, it can often be a dangerous thing delving further back into their discography. Sometimes you uncover some real greatness, but at other times you're just left digging through some half baked records by a band that just hadn't put the pieces together quite yet. I first heard of The Blind Shake when my buddy @swamipat made me buy the Garbage On Glue 7" while we were record shopping in Chicago. Not only did I love that, but their next full length Key To A False Door was one of my favorite records of last year. So, now begins the march backwards through their catalog, starting with their 2011 LP Seriousness. While I'm partial to Key To A False Door, this record is another ripper. The band has a way of channeling noisy chaos into these perfect songs. They're deceptively catchy, but the thing that really shines through is their energy. I just really believe they love cranking out this mess. 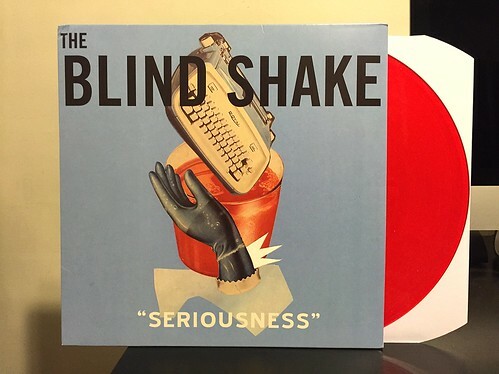 Like the band Heavy Times, on the surface it doesn't really make sense why I like The Blind Shake as much as I do. They're way more noisy and blown out than I typically go for, but there's something uniquely special about these guys that just makes me obsessed with their records. With another new album coming out this year on Goner and a couple of more old records to go through, it looks like I've got some work to do to get caught up. Love their stuff. I'm doing the same to get their catalog. I'm a little confused on the Micheal Yonkers connection but I am still needing to research that. Pool Party - Born To Lose 7"
Beck - Looking For A Sign 7"
The Jackhammers - S/T 7"